When It Sakkara pongal , Ama Vadai and payasam, are indispensable dishes in all festivals and feasts. On Pongal day Sakkarai Pongal is usually prepared in a Pongal pannai traditional vessel called paanai (pot) instead of a pressure cooker. Pots of rice with milk and sugar are boiled to make sakkarai pongal or sweet rice .I decorated pots with sandanam& kukum then I tied pot with thread with Manjal (turmeric piece, and flower.Fresh turmeric is tied round the pot.Then I put kolam(traditionally rice flour) in gas stove and put the rice in, the pot to cook the food in .The boiling over and spilling out of the contents of the pot is the auspicious sign that the family waits for. And Pongal literally means "Boiling Over"Regarding Pongal when it started,how Read history here. 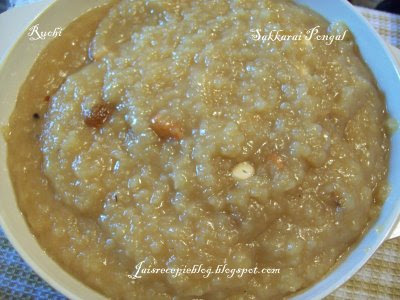 Sakkarai Pongal is a very common recipe in all parts of Tamil Nadu, each one will have there own way to prepare one. Though the ingredients are the same throughout, the procedure may differ from each person. Wash the rice in water, drain and keep aside. Dry fry the dhal till golden brown, wash and add to the rice. 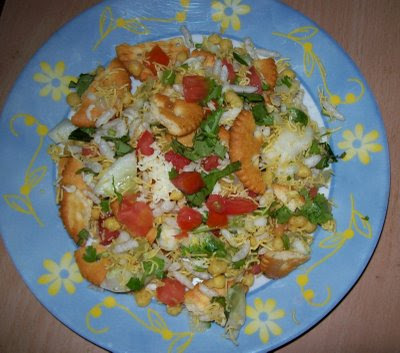 Boil the milk (diluted with two cups of water), when it started boiling add the rice and dhal mixture to it and cook. Cook moong dal and rice, till half done. Drain the excess water and keep them aside. Now put jaggery into the cooked mixture rice and heat it Then pour about a table spoon of ghee into it and keep stirring till they blend together nicely. Fry the cashews and raisins in one tablespoon ghee, pour into pongal mixture along with the powdered cardamom. 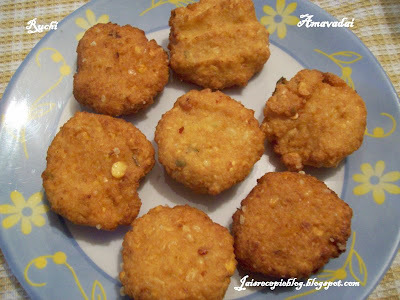 Aama vadai is a south indian speciality snack that is prepared on every single occasion Ama vadai occupies the foremost position in a menu prepared for any festival. 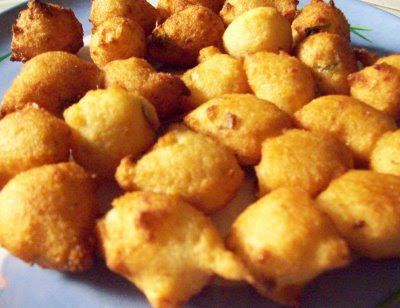 Ama vadai is prepared by frying a flattened ball of ground lentil and spice.Everybody like to eat this vadai as and when they are fried. 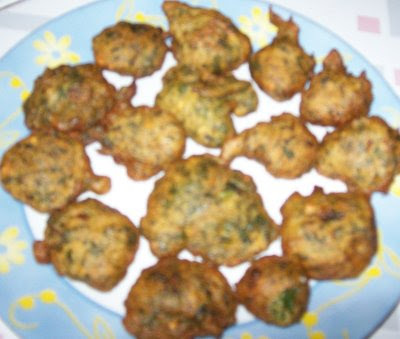 There are a lot of variations in preparing these vadai. It depends on the proportion of dals used. 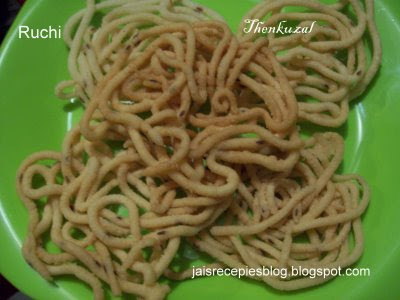 This is a snack which I always enjoy with tea..Previously In my home I used to grind it in attukal.. Nowadays it is prepared quickly using the mixie/blender. 1. Soak the three 'dhals' in water for 1 hour. 3.Add the curry leavesand grated coconut. 5. Heat the oil in a pan and fry both sides until golden brown. 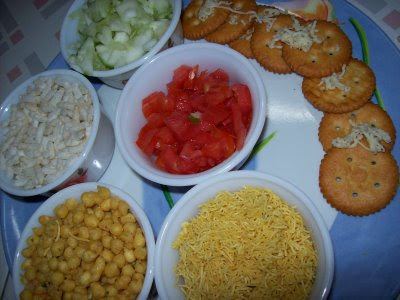 And this is my entry for Festive Food: Makar Sankranti event hosted by Priti. Wow amavadai looks delicious...sakkarai pongal makes me hungry...lovely array of great snacks..
Hope you had fun celebrating pongal! Ama vadai and sakkarai pongal looks delicious! Nice goodies for Savouries event... I want to try your biscuit chat! 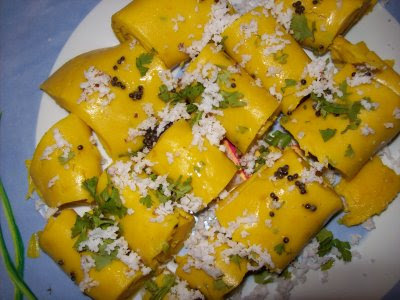 Wat a feast Jaishree....i wish i had these in front of my eyes now...am drooling! That is a feast!! so many snacks, especially the sakkarai pongal and the thenkuzhal are my favourites! 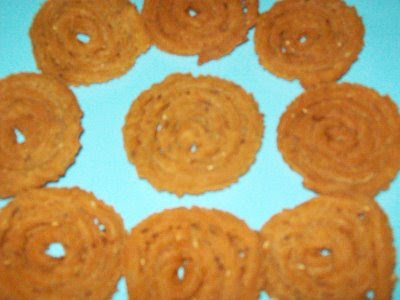 Amai vadai is my all time favrt... looks so inviting with yr delicious pongal. perfect entry for the event.. love them all. Sakkari pongal parkum bodhu suppera iruku..Looking delicious..Reminds me of my mom's one..
Pongal looks so delicious with ghee floating! Vadai also looks mouthwatering! Great entries for the event.I have to go through ur biscuit chat! Love it! Oh God! rows of delicious and mouthwatering posts.